The Stepwise Approach towards Rabies Elimination (SARE) has been developed as a template that countries may use to develop activities and measure progress towards a national programme and strategy for sustainable rabies prevention, control and eventually elimination. A PDF containing all of the information on the SARE tool and the relevant contents within the SARE assessment scoresheet can be downloaded here. The SARE tool provides an Excel assessment scoresheet with measurable steps, designed as a logical flow of activities, to progress from Stage 0 to Stage 5, in efforts towards freedom from dog-transmitted rabies. 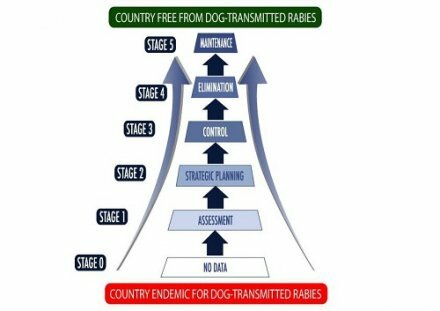 Countries with no information on rabies start at Stage 0, while others may start further along the scale, and when the country reaches Stage 5, it is free from dog-transmitted rabies. Please click here to request a copy of the SARE assessment scoresheet. A recently published case study on the use of the SARE tool in Ethiopia can be accessed here in order to gain a better understanding of the SARE tool and its versatility as a monitoring and evaluation tool. previous page: 6.1 Why a tool for stepwise rabies control?